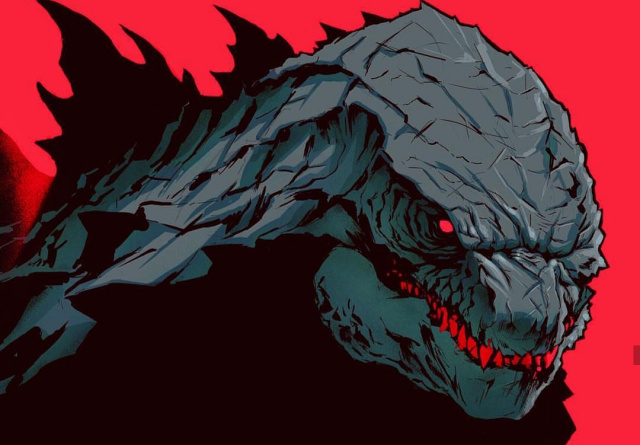 At this point, Spoiler Godzilla would be the most accurate and current name for this version of Godzilla from the upcoming sequel, but unfortunately it is not. Since we unveiled the new Jakks Pacific Godzilla figure images and revealed what looked to be Burning Godzilla - fans were polarized by the acknowledgment of this information. Names and classifications for Godzilla's various incarnations are important. This also helps to separate the association between this and Burning Godzilla from Godzilla vs. Destroyah - meaning Godzilla's Fire state is not indicative of him internally combusting, like that of Burning Godzilla. In our previous report we exclusively revealed that Godzilla becomes Fire Godzilla by Mothra transferring her power to him in order to take out Ghidorah. 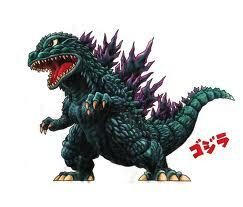 Until we hear otherwise, this Godzilla will now be referred to as Fire Godzilla. Let us know what you think of this name in the comments! Banner artwork created by Bill Couture. Hmmm........ kinda generic and tame. I feel like a more exciting and impactful title ought to be brought in. Maybe Radiant Godzilla? Thermal Godzilla? Aside from Fire Godzilla not being a state where Godzilla will eventually reach meltdown (assumingely), is there a difference between Fire Godzilla and Burning Godzilla? As long as Godzilla has the Spiral Red Atomic Breath or something like it I'm happy. Kind of generic, but as long as the name is not mentioned a lot (if at all) then I will be fine with it. I wonder if they ran in to some rights issues with the name, "Burning Godzilla". I can't find any official trademark of the name, but I recall Pipeworks having some issues using the form in Godzilla: Unleashed. So they called it "Critical Mass" instead and got away with it. During the production of Godzilla vs. Destoroyah the form was called "Red Godzilla". Immediately following the release of the movie, merchandise and toys merely called the design Godzilla '95. It wasn't until later that toy releases started calling it "Burning Godzilla". It seems like "Burning Godzilla" is merely a fan name that got popular and Toho ended up using it, sort of like Ultraman Jack. But if that were the case, I wonder why Pipeworks had issues with it back in 2007. In any case, it's clearly meant to be an Easter Egg referencing Godzilla vs. Destoroyah. What it's called shouldn't really matter since the form's had three titles before "Fire Godzilla". "Fire Godzilla", aka what the Tristar CEO said after they decided not to move forward with the 1998 sequel. Yess! Fire Godzilla is not melting down! Thank you Dougherty! Reminds me of dark Supercharged Godzilla from Trendmasters back in 90s! This is so awesome! Please don't kill Ghidorah or mess over his heads. Nice to see our father and Lord Godzilla controlling his heat output like Scarlet Godzilla in the anime! I still prefer Thermal Godzilla. Fire Godzilla is a generic name. It should have been a more awesome name like Blazing Godzilla. Could also be a nod to "Fire Rodan"
Nod to Final Wars when Ozaki transferred his Kaiser power to Godzilla to help defeat Kaiser Ghidorah. I bet Dougherty watched that move for inspiration... and said... how about Mothra transferring her energy to Godzilla to defeat Ghidorah? Now if that's the case... we're gonna be in for a treat. Just because there’s a action figure doesn’t mean it will be in the movie. There have been many toy variants that will get released but aren’t in the movie themselves. There’s a big chance this is just made to look cool.